Mm, looks yummy! At the risk of sounding like *une stupide americaine*… I always do a double take when I see pudding that looks like.. cake. Bad habit. Thankfully i’m not too fond of either where I might order a pudding expecting a cake… heh. Tasmanian Leatherwood Honey, hm. I wonder if that can be had here without paying 3 arms and a pair of legs. Ps I also bake them in a Texas muffin tin, and turn them upside down on the plate for presentation. P.S – dessert on fri nite? Hey Yvo… Yes the pudding deal can be confusing when it’s not all wobbly and having the consistency of sloppy yoghurt…but don’t worry, you’re not the first American to get tricked. Mumma… I like how you said it looks “almost as good as” yours… Which at least gives me room for improvement. I think next time i’ll probably make it in smaller dishes… or the ramekin things I bought to make souffles… because the one big cake was a bit too much and didn’t look as nice on the plate. I will take the orange rind under consideration too. Dtm: don’t encourage her… I will never be able to pass off her desserts as mine anymore if she tells everyone how to do it better… which she can easily do being the queen of the dessert. 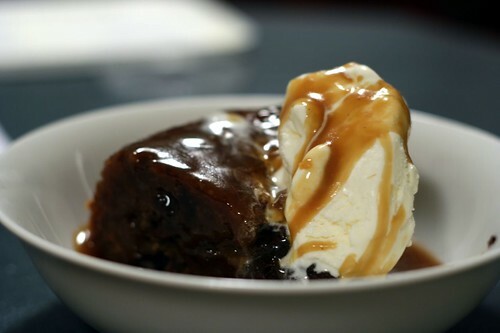 And im not sure if sticky date pudding is really a steak and poker kind of dessert… but we’ll see. Breathtaking. Be still my hardening arteries. And happy b.day for the other day. Nice pud. How did you like the honey? The guy that sold it to me said you will either love it or hate it. I happened to love it, so I was just wondering what you thought. Hey JenJen, loved the honey. Although I’m not sure why anyone would hate it… I didn’t get the honeycomb like you though… so perhaps that might make a difference due to the added rawness (?). I found it a really nice combination of earthy sweetness… so thanks again for the recommendation. Howdy Swee, well I hope this one will turn out really really *really* great if you decide to make it :) thanks for stopping by. I usually spent about S$20 to pop in my favorite restaurant/ cafe in Singapore just for this dessert. Now after I try this (if successful) I wonder if it’ll still be my favorite restaurant/cafe…. Oh, btw, can I exclude the choc chips? I would use some olive oil though for more moisture, perhaps as part of the butter.